Isn’t it an interesting evolution to realize that baked bread can sustain people even if they have nothing else to eat, while raw flour cannot? Bread in its most basic form is often composed of nothing more than flour, water and salt. Bread can be combined with other very simple ingredients of nutritional value to form a basic diet that sustains us. I am deeply inspired by Italian chef, Massimo Bottura, whose Osteria Francescana restaurant in Modena, Italy was named the top restaurant in the world earlier this summer by World’s 50 Best. Bottura has founded a non-profit organization, Food for Soul, that is partnering with Gastromotiva, founded by chef David Hertz, to promote social change through gastronomy. Refettorio Ambrosiano, Hertz’ community kitchen in Rio de Janeiro, will open its doors on 9-Aug to offer free meals to Rio residents who need food services. It will be open for dinner every day and Bottura and more than 30 guest chefs will cook with whatever surplus ingredients are available from the Olympic Village, local catering services and sponsors. There are additional components to the future success of Bottura’s plan to open soup kitchens in other major cities around the world, including creating recipes with leftover bread, leveraging food waste and creating a sustainable food culture. It’s a much broader mission than just one event. I often say that bread is my favorite food group. I love the easy juxtaposition of crunchy crust and crumb. 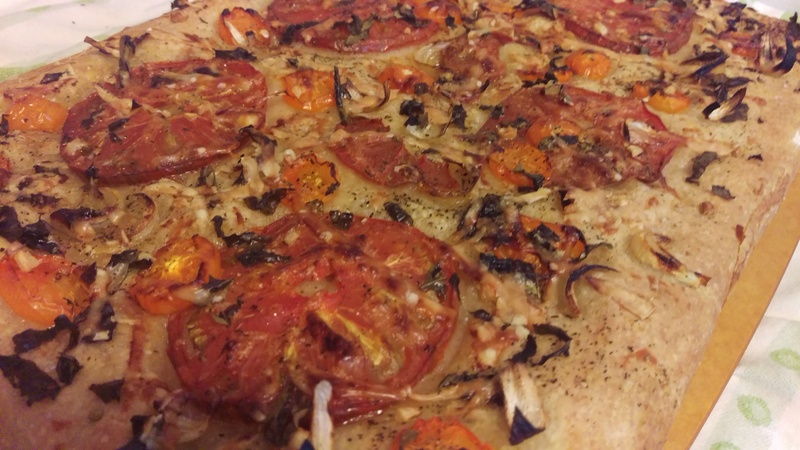 A focaccia of humble beginning is easily elevated to art through the addition of fresh, inexpensive ingredients such as heirloom tomatoes, fresh garlic, onion, basil, fresh herbs and a bit, yes, a bit, of Parmigiano Reggiano. Oh yes, a few gobs of glorious olive oil. Accompany as you wish: roasted fresh vegetables, pickled and grilled local fruit or, oh well, a berry dessert. Bread’s simple complexity has the power to sustain the world. As projects of this type and scope succeed and we, as a society, find ways to successfully redistribute food resources, we can, indeed, feed the world. As a pastry chef, that’s a process I plan to actively support.